Father and daughter serving aboard carrier Harry S. Truman together. 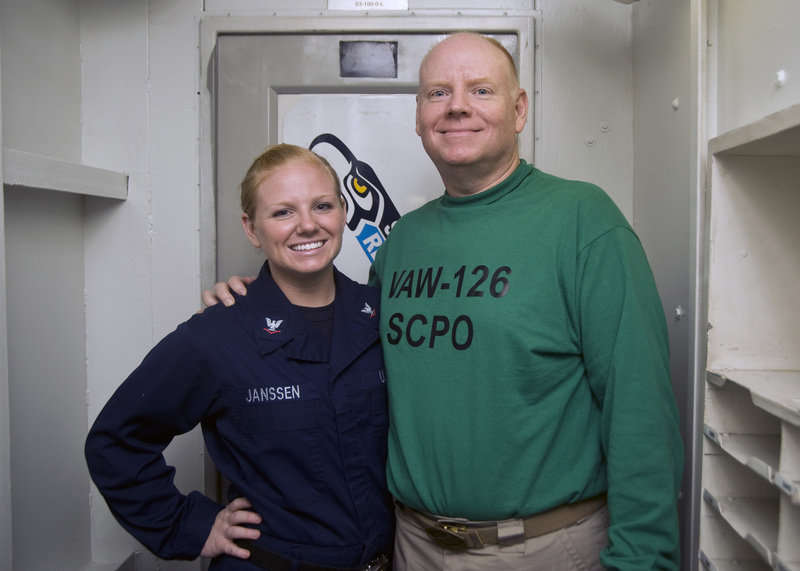 Though Senior Chief Aviation Machinist’s Mate (AW/SW) David Janssen missed being with his daughter during past deployments, it won’t be a problem in his upcoming one. Janssen will deploy aboard the carrier Harry S. Truman with his daughter Breanna, a gunner’s mate 3rd class. It will be her first deployment, and the ninth and final deployment for her father. “While I may not be able to make up the time we’ve lost, at least I’ll be right beside her this time around,” said David Janssen, the leading chief petty officer of maintenance control for the “Seahawks” of Carrier Airborne Early Warning Squadron 126. The senior chief said that despite the many duties on board the carrier, he will always find time for his daughter. Breanna, who said she joined the Navy because of her father, looks forward to serving alongside her dad and hopes to have a career like his. “I admire how much he loves what he does,” she said.